Advanced machine tooling equipment will now be available to industry in the region for the first time as complete solutions with the launch of Kingsbury’s operations in the UAE, the company said. The British production solution provider brings 60 years of expertise and a portfolio of state-of-the-art German machinery suitable for a wide range of industries. The machines being marketed are from Kingsbury's three divisions - LPM (large prismatic machines), MTG (milling turning grinding) and AM (additive manufacturing) - and are being offered for sale in the UAE, Saudi Arabia, Qatar, Bahrain, Oman and Kuwait. The company has launched operations in the region after identifying a high demand for metal-forming machines, as production manufacturing is placed to assist diversification in the growing regional economies. The precision machinery is used to manufacture products in the aerospace, transport, medical, industrial, and energy sectors. "We are delighted to be up and running in the GCC,” said Richard Kingsbury, managing director of Kingsbury. “Our strategy will be to transfer to this new market the same business model that has proved very successful for more than 60 years in the UK and Ireland. Until now, these were the only markets covered by the agency agreements between us and the machine tool manufacturers we represent. "Every manufacturer is a leader in their respective fields, which means we are able to provide customers with optimal production platforms in a wide range of industries, from the smallest medical component to the largest power generation part. "We are looking forward to bringing the same technology to the Middle East. To facilitate this, we will be recruiting and training highly professional sales, applications and service engineers to deliver manufacturing solutions that provide the lowest end-to-end cost per part coupled with the highest accuracy, reliability and repeatability," he said. More than half a century of experience in the sector provides Kingsbury Gulf with an unparalleled level of expertise and know-how in providing across the board support, said Kingsbury. “The UAE and wider Gulf region is witnessing diversification away from traditional oil and gas economies towards more of a focus on high-value manufacturing, we feel that our products can help to play an important role in that change,” said Neil Harrington, regional director and general manager, who heads the wholly-owned subsidiary in Dubai. “There is a rising demand for machining equipment in the region and our expertise and experience will help to meet those demands. The manufacturing sector in the region is gathering momentum and as a result, we are expecting to see strong demand for the products and services we offer,” added Harrington, who has long experience working in senior management positions in the Middle East. The company, which is headquartered in Gosport, Hampshire, in the United Kingdom has worked for decades with prestigious original equipment manufacturers (OEMs) together with a loyal and expanding customer base of sub-contractors. This makes Kingsbury machines represented in almost every aspect in various industries, across a wide range of applications, the company said. This extensive level of knowledge provides Kingsbury with a keen understanding of production requirements to go along with an impressive track record of enhancing machine efficiency and resolving manufacturing issues to reduce costs and maximise productivity. The comprehensive range of machines is sourced from respected leading German manufacturers: Burkhardt + Weber, Waldrich Coburg, Haas, Index Traub, SHW Werkzeugmaschinen, Hermle, Zimmerman and French manufacturers: AddUp a leading manufacturer of additive (3D printing) machine tools. 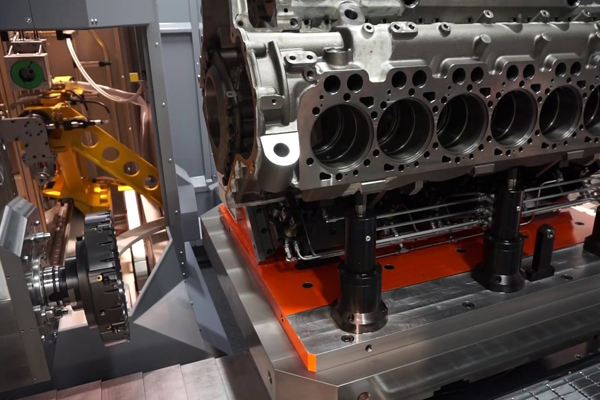 This, together with an unrivalled technical expertise in Computer Numerical Control (CNC) machining as well as a background in providing comprehensive service support, means Kingsbury can offer the total solution to meet client needs, it said.